I hope you can do one for my future sister-in-law too who is getting married on the same day as me. 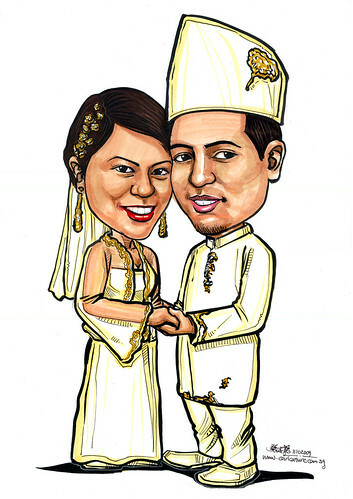 - Caricature in colour marker with theme. - Full-length similar to photo dress_color_style.jpg. The bride’s hand on the groom’s shoulder I find is a bit awkward and their pose is rather stiff. Could you instead use something similar to pose.jpg. Something more intimate. I leave to your good advise. - Same colour for the wedding outfit and everything as dress_color_style.jpg. I.e. creamy with gold embroidery. I know the picture is not very helpful as it is quite blur but that is the pic given to me, the outfit she will be wearing. Basically a flowery embroidery for the bride’s outfit like dress_flower_details.jpg. - Bride & groom pic as attached." The colour they have chosen (as in the photo provided) is creamy white. As such, it looks rather pale, as compared to the other job. However, the mix-and-match of the posture and wedding gown design took up some time from me. Not so straightforward as my usual job.